The 1/8-thick Forex® backing panel can make your dreams of even the largest format pictures come true. This sturdy foam-core material is extremely light, making it a snap to hang on any wall. Even if you’re looking to display pictures in a sheltered outdoor area, this material proves incredibly resistant and durable. The white PVC offers the perfect foundation the 6-color printing process. The direct print on Forex® is our recommendation for everyone who wants a matte surface and affordable, lasting perfection for their photos. The crystal clear surface is 1/16″ (2 mm) thick and adds a subtle depth to the image while accentuating the colors.thick and adds a subtle depth to the image while accentuating the colors. 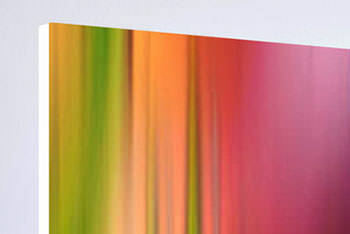 A Direct Print Behind Acrylic Glass is an introduction to the aesthetic benefits of acrylic. The crystal clear surface is 1/16″ (2 mm) thick adds a subtle depth to the image while accentuating the colors. The visible wood grain on Direct Wood Print provides a very special look. The more bright areas in your picture, the more intense the effect will be when the photo is printed on wood. This look is achieved by using a 7-color printing process that leaves out the white inks, which allows the high-quality wood to remain visible, and in the brighter areas, the wood texture to shine through naturally. The lab uses light shatterproof acrylic glass for acrylic glass laminations of the photo prints on Kodak Metallic. The sturdy backboard made of aluminum Dibond ensures additional stability and durability. The brilliantly shining acrylic glass highlights the impression of depth of your image and intensifies the radiance of the colors. The integrated wall-mounts on the back of the picture make it easy to hang. Depending on the size of your picture, 3 different wall-mounts are included in the standard price. The six-color print creates a matte finish without reflections. In direct print on brushed aluminum, the white parts of the image are not printed, so the brushed surface shines through, giving the piece an overall metallic sheen. The high-quality print is waterproof and resilient.